Along the trail to Telluride. This is a shot as we road on the high road to Telluride. As I've mentioned many times before I love the Aspen trees. You can't see it in this photo, but theres a magnificent waterfall in the distance. This was taken about 1:00 in the afternoon, and it was cloudy and overcast, which enhanced the colors. As we started back over the mountain from Telluride it started raining on us, then sleet, then snow. It was a chilly ride back to the hotel in Ouray, but well worth it. LESSON OF THE Aspen - from "The Wisdom fo Trees" by Jane Gifford. "As the wind passes through the aspen leaves, they whisper a message of peace: listen within yourself and find comfort in the still, small voice of calm; in the music of the spheres; in the resounding "om" of existence; in the voice of Goddess - whatever you chose to call the spirit moving through the silence within us. You can interpret this in whichever way is most personal to you. 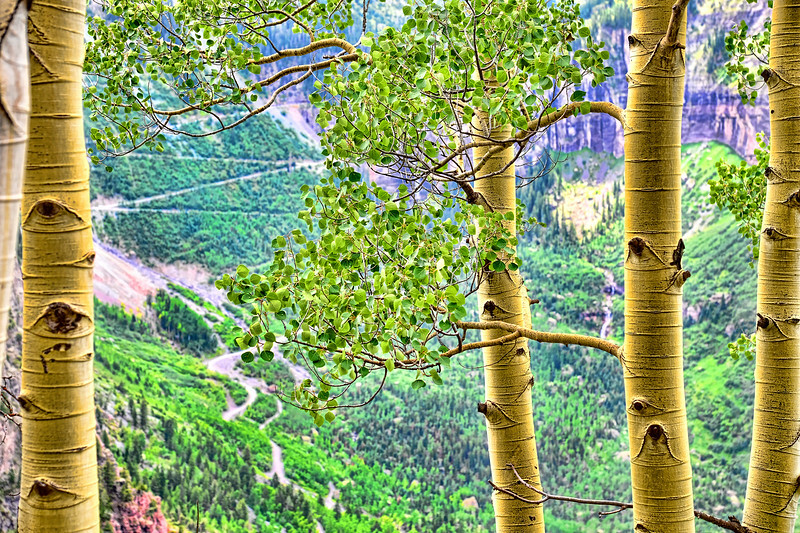 The aspen teaches the lesson of fearlessness, and gives us the strength to face fear that comes with the unknown. To quote Dr. Bach, aspen helps us to understand that "the power of love stands behind and overcomes all things." Once we know this to be true, "we are beyond pain, suffering, care, worry, and fear, and we become participants of true joy." Have a satisfactory Saturday my friends. Looking forward to "M" day tomorrow. Green, green, green, all the world is green ; a pictural aspect in this shot. Love this pov and your pp! This is so very very gorgeous!